This Bank Holiday Monday, you can keep the heat outside while you stay chilled behind the wheel of your car in the inevitable traffic jams by investing in an Ellesmere Port air-con re-gas from Car Clinic MOT Centre. With expertly trained, experienced technicians your car is safe in our hands, and with Car Clinic MOT Centre, comfort doesn’t need to come at a high cost. Air conditioning systems work using a gas called a refrigerant – that is the substance which is topped up when you have your air conditioning re-gassed. The amount of gas in the system gradually reduces over time, and so it must be checked and re-filled regularly to keep the system in working order. 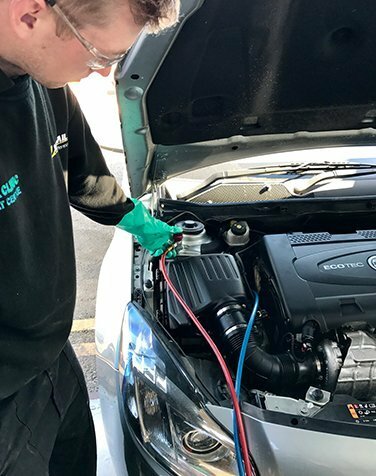 Many drivers use their air conditioning all year round to keep the system running at its optimum efficiency, but with increased use comes increased strain, so it is important to get it checked out regularly – especially this time of year when you will soon be relying on it. Air conditioning can lose between 10-15% of its efficiency per year, so be sure to pop into Car Clinic MOT Centre Ellesmere port for a free air-conditioning check before the Bank Holiday. Most manufacturers recommended that you recharge your air conditioning system at least every two years to keep it running most efficiently. This is not a service that is typically included as part of a standard car maintenance schedule, and so it is often overlooked. If your car is older than two years then more likely than not a recharge is due.